Work with teens from around the world Montgomery Village, MD! If you are outgoing, well networked in your community, enjoy learning about different cultures and have a desire to make a positive impact on teens both locally and globally then JOIN OUR TEAM! Education, Travel & Culture (ETC) is a non-profit organization providing inbound and outbound international exchange opportunities for over 400 high school students each year from over 15 different countries. Since 1998 ETC has maintained an outstanding reputation for providing personal attention and service throughout the entire process. ETC Local Coordinators (LC’s) help make exchange students dreams come true! LC’s work closely with exchange students, host families, and local high schools. 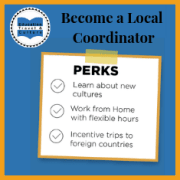 LC’s are actively involved in the recruitment of volunteer host families, who provide housing for our international high school students for either a semester or a school year. ETC recruits host families many ways including: posting on social media, meetup.com, nextdoor.com, visiting local groups and organizations, emailing, cold calling, booths and festivals, distributing flyers, churches, advertising on blogs and volunteer websites, and spreading the word to everyone you encounter. If it weren’t for our LCs, ETCs exchange program would not exist. LCs play an intricate role in finding loving host families that welcome foreign students from all over the world with open arms. LCs are provided with training, tools, and resources to successfully find volunteer host families. LCs work closely with their Field Managers who provide guidance and support throughout your recruiting efforts. ETCs culture is family-friendly, flexible, fun, and only requires a minimum of 5 -10 hours per week. ETC offers professional development and advancement opportunities- All ETCs Managers were once LCs. ETC offers travel incentives and stipends throughout the year. Earn the President’s Volunteer Service Award (PVSA). Executive staff have over 25 years’ experience and have a genuine passion for student exchange. ETC staff and LCs know students by name, they are not just a number. Learn new skills, build your resume, earn volunteer hours and make a difference by volunteering for ETC!